Here are sausage and eggs in a tasty dish perfect for a weekend morning. 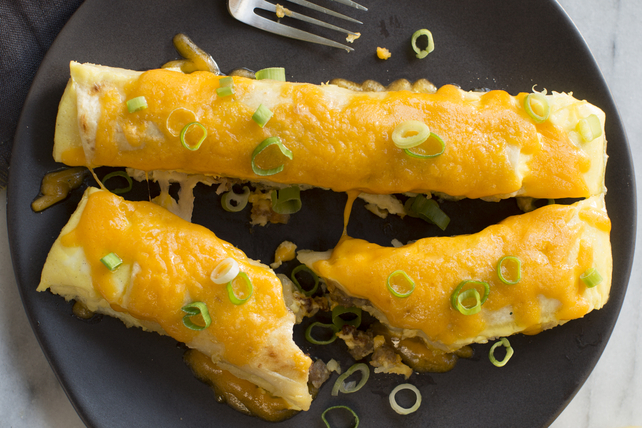 They're rolled up in enchiladas with hash brown potatoes and baked until delicious. Cook sausage in large nonstick skillet on medium-high heat 5 min. ; drain. Add hash browns; cook 5 min. Cool 10 min. Heat oven to 350ºF. Add 1/4 cup cheese to hash brown mixture; mix lightly. Spoon down centres of tortillas; roll up. Place, seam sides down, in 10x6-inch baking dish sprayed with cooking spray. Whisk eggs, milk and flour until blended; pour over enchiladas. Cover. Bake 30 min. Sprinkle with remaining cheese; bake, uncovered, 10 min. or until melted. Sprinkle with onions. If you don't have a 10x6-inch baking dish, you can use a 13x9-inch baking dish instead.